Before the merger: When the bowl of bibimbap arrives, you are meant to lunge in there with chopsticks and beat everything together lickety split or, cautions Anne DesBrisay, the staff will do it for you. What was coming came a few minutes later: sizzling dolsot (stone pot) bibimbap, about which he was a greenhorn. 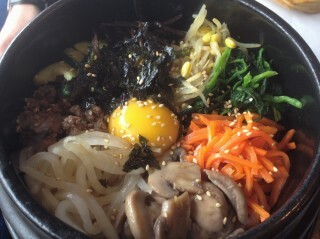 If you don’t know Korea’s famous dish called bibimbap, you need to be initiated, and Le Kim Chi seemed a good beginning. Bibimbap is that petal-like arrangement of sautéed vegetables, beef, crackling nori, and wiggly egg on rice, the raw yolk glistening at the head, the whole dotted with toasted sesame seeds. Stop too long to admire the still life at your peril: you are meant to just plunge in there with chopsticks and beat everything together lickety split, or the staff will do it for you. This I have learned. But you have other options. You can reach way down to detach the rice still cooking on the bottom of the hot pot, or leave some of it still stuck, still sizzling, to savour later, when it’s bronzed and crunchy with a nutty flavour. You can customize as you wish from the little gifts of pickled vegetables – they change all the time, but always there is spicy kimchi. You can slather on the gochujang (hot pepper sauce) or just dob it on. Or leave it off altogether. No one will judge you. The raw egg cooks in the heat of its companions, and keeps the whole — veg and meat and the sweet pungency of sesame oil that weaves through it all — on the moist side. It makes a filling, flavourful lunch for $12.95, and at Le Kim Chi, it comes with miso soup. Le Kim Chi, 420 Preston St., 613-233-2433.